Today I received my shipment of the most recent bunch of kitsuke (kimono dressing) accessories I ordered, and now have enough to merit a dedicated post. The accessories below are numbered in approximately the order they’re worn, so the numbers jump around a bit. 1. 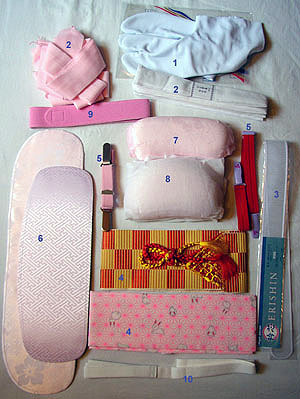 Tabi – white socks, which should be put on first, before the kimono. 2. Koshihimo – mine are white and pink muslin, you can see the two sets. Koshihimo also come in silk, but so far I’m quite happy with muslin, as it’s very sturdy and “grabs” silk well. These sashes are used to tie the juban (underkimono) and kimono, but aren’t visible when finished. They can also be used as temporary sashes when folding an obi musubi. 3. Erishin – collar stiffener, put in the han eri (nagajuban collar) to better keep its shape. Can also be put in the kimono collar. 5. Kohlin belts (two again). A recent addition to kimono dressing, these elastic contraptions hold the nagajuban and kimono collars at the proper angle. With some skill, koshihimo can replace them, but it takes practice to learn how and be comfortable with it. 6. Obi ita, also called mae ita. Obi stiffeners made of fabric-covered cardboard, they’re placed in the obi to help keep its shape. The longer one is for reinforcing the front of an obi when worn, whereas the shorter one is most often used to support the back obi musubi. 7. Obi makura – literally “obi pillow”, a firm “pillow” that supports obi knots. This size is typical of the one used for otaiko musubi, the most common type of knot. 8. Another obi makura, this one is for fancy obi musubi such as tateya and fukura suzume, but can also be used to tie an otaiko. 9. Minibelt – apparently this felt-covered strip of rubber (which is twice as long as it looks here) is used to temporarily hold the folds in obi musubi. 10. Sanjyuu obi himo – literally “three-ply obi cord.” This is a wonderful belt with a middle made up of three layers of elastic, which you can see on its left. Why is it wonderful? Because with this belt, tyeing complicated obi musubi is much easier! Many fancier bows have successive layers of folds, which this belt’s elastic layers can hold together. I didn’t start out meaning to do kitsuke “lessons”, but am liking the idea now. Most Japanese-language books call them just that – “lessons”, using the English pronunciation, written in katakana – so it’s kind of a “play on a play on words”, me being a beginner who needs her own kitsuke lessons. Next Lesson! (there I go playing around again) will be on just that: Japanese kitsuke books. They can be hard to find for those of us with little knowledge of the Japanese language, so I’ll recommend my favorites and where you can buy them. This entry was posted on Monday, April 7th, 2003 at 18:54:28	and is filed under Kitsuke. You can follow any responses to this entry through the RSS 2.0 feed. You can leave a response, or trackback from your own site.